+ using Ctrl + N (release Ctrl before pressing N). This will act as if you clicked "New"
This addon works with the default Carbine ChatLog. It has not been tested whether it works together with other ChatLog-replacement addons. There will be no extra functionality implemented. The only possible reasons for an update would be "bug-fixes" or "compatibility with ChatLog-replacement addons". 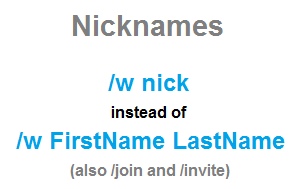 The theory is that some ChatLog-replacement addon will make "Nicknames" redundant in the near future.